SolarAcademy's mission is to deliver the most complete information on solar solutions to consumers, home owners, commercial property owners and anyone who wants to learn more about solar energy. We are solar industry veterans with deep industry knowledge. We launched TheSolarInsider because we believe the cost of educating the consumers about solar options (aka cost of sales & marketing) is still one of the largest cost components of delivering solar solutions. We believe providing the consumers with comprehensive solar know-how will decrease the total cost of solar and accelerate its adoption. Sunrun et al. Helping or hurting the cause? “What Happened When I Bought a House With Solar Panels” is a pretty negative article about Sunrun (the leading residential solar company in the US). This piece was published on Bloomberg Businessweek a few days ago and exposes the negatives about the Third Party Ownership model (lease-based solutions) in residential solar which we talked about here. Also, it exposes the negatives that can happen when companies grow too big, too fast, and lose control on their sales teams’ ethics. I heard similar issues existed inside SolarCity before Elon Musk shrewdly folded it under Tesla so it wouldn’t become a major mess and a stain on his collar. I have respect for what Sunrun and SolarCity did for putting solar on the map in a big way. They played a critical role in pushing solar into the mainstream. Leveraging their policy influence and billions of dollars of tax equity and wall street capital they created solutions that made sense for the market 6-7 years ago and capitalized on it while keeping the consumers somewhat in the dark. Other large players like Vivint, Sunpower, Sungevity and many others sold these solutions as well. The lease-based solutions were never the best deal for most consumers but they were certainly easy to understand, and more importantly easy to sell. As solar prices keep coming down, and consumers get more knowledgeable, these “lease-based solutions” do not make that much sense anymore. There is no doubt in most cases, owning a solar system is a better deal than leasing one. This entry was posted in Uncategorized on February 19, 2019 by SolarAcademy. The first time I heard of Varun Sivaram and his book Taming the Sun was about 6 months ago from a friend of mine who is a member of the Council on Foreign Relations. The second time was last week when my son’s math teacher told me about Varun and his book. I got to do some reading and research on Varun’s views and appreciated his vision for a clean energy future. I liked Varun’s views on energy, policy, solar energy, and innovation. I found his views on the future growth of solar interesting. Unlike Tony Seba, he does not think solar will necessarily continue to grow exponentially. Varun is concerned that solar might hit a ceiling just like nuclear did in late 20th century. He also has a balanced portfolio theory on energy which resonated with me. This entry was posted in Uncategorized on February 5, 2019 by SolarAcademy. Solar support as a service versus Software as a service. There are a number of leading Solar SaaS companies emerging in the solar industry as the industry grows. Some of these leading Saas tools and companies are listed here on this page of SolarAcademy. As a leading distributor of solar equipment, we (CivicSolar) interact with thousands of solar installers and developers from all 50 states and beyond. As we define the scope and strategy around our service platform, one question that is at the forefront of our minds is how our customers like to interact with their service providers and their SaaS (Software-as-a-Service) tools. Some solar installers prefer to build organizations that house major functions like sales & marketing, procurement, and financing in-house. Others prefer to outsource these functions to third party service providers. The installers that build these functions in house are generally larger in headcount and revenue. And they generally sell one or two uniform solution offerings on a repeat basis. A typical such customer is a residential installer with 30+ employees. These types of installers generally use various Software as a service tools to design and to sell their projects but also as a platform to coordinate the various functions between departments in their companies. And then, there are thousands of installers / developers that are selling less uniform solutions. They approach each project as a unique problem. Most commercial solar projects fall into this bucket. These companies care less about Solar as a service tools but care more about getting high quality support services (for procurement, sales, finance, design, etc.) from their vendors. Wunder Capital founder Bryan Birsic talks about this dichotomy in minute 5:28 of this Greentech Media panel about the Platform of Solar future. This entry was posted in Uncategorized on January 30, 2019 by SolarAcademy. State by State, State of Solar. This recent report by Solar Power Rocks is a great resource in showing the state of solar in each state, in the US for 2019. The report rates each of the 50 states based on 10 factors and then assigns an overall weighted average grade for each sate based on these factors. This entry was posted in Uncategorized on January 4, 2019 by SolarAcademy. Greentech Media has been a dominant voice in the solar and advanced energy sector in the past decade, delivering renewable energy news, market analysis, and conferences that inform and connect players in the global clean tech energy market. And they were recently acquired by Wood Mackenzie, a leading research and consultancy group focusing in the energy, chemicals, renewables, metals and mining sectors. Greentech Media recently published their 2018 Q4 US Solar Market Insight Report. You can download the executive summary here. 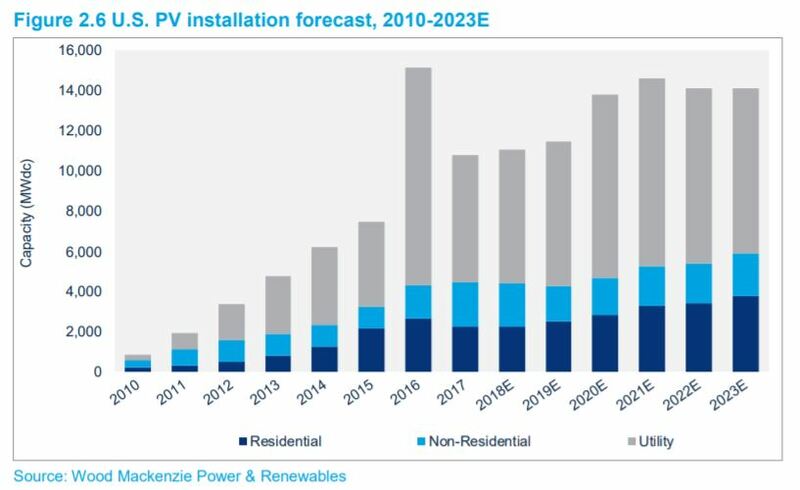 This report forecasts a slowing growth in the US Solar market as depicted in the below chart. They are forecasting a less than 50% growth for the next 5 years for the residential & commercial solar market in the US. We believe that forecast is too low. We expect the market to grow at least 75% in the next 5 years. This entry was posted in Uncategorized on December 29, 2018 by SolarAcademy. How long is the payback period if I put solar on my home or commercial business? And I say, it depends. On many factors. In a place like Hawaii where electricity is 3x more expensive than the average state and sun is plenty, your payback period might be 1-2 years. In California, where electricity is 1-2x more expensive than the average, it might be 3-5 years. In other places it could be 5-6-7 years or even 8-12 depending on the local electricity price, local state and city incentives, and the amount of sun (in that order of importance). How many years will the solar panels work for? And the answer for that question is: 30+ years. At this point almost all solar panels come with 25 or 30 years warranties. And most panels will last up to 40 years. Panel do suffer from degradation at the rate of about 0.5% or less per year. So after 20 years, a panel will likely produce 80-85% of the energy it produced in its 1st year. I have had conversations with veteran solar pros who have installed panels 35+ years ago and they say their panels are still producing at 75% plus of their first year production. This entry was posted in Uncategorized on December 27, 2018 by SolarAcademy.